Hint says to find it under the drain in the plaza but I cannot find one. 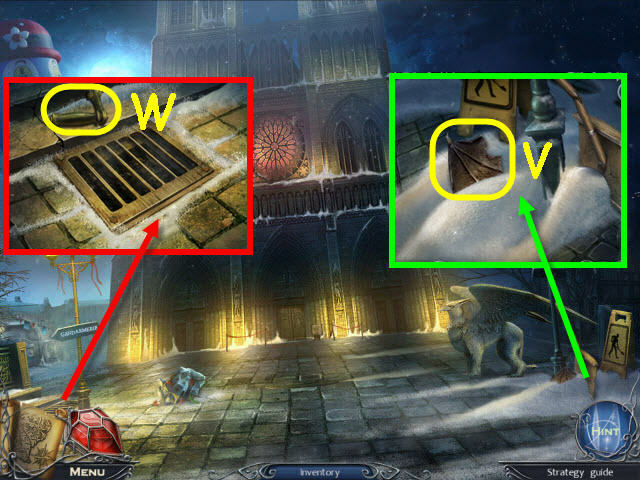 I checked our 9: The Dark Side Of Notre Dame Walkthrough, and it does have a screenshot showing where the handle should be. You can see it by clicking right here (it's marked "W"). If the handle isn't there for you, it may be that the game is waiting for something else to happen somewhere else before it will become visible. In that case, you might scroll through the walkthrough a bit and see if it shows anything else you can do. But if the handle really isn't showing up, there may be more of a technical issue going on here. First, I'd try uninstalling and reinstalling the game. Starting over with a new profile could be an option as well. And our Tech Support Team will also be happy to take a look at things for you. You can contact them by clicking here to submit a support ticket via email. If you're a Big Fish Game Club member, you can also connect to Live Chat Support Monday-Friday 7:30am-4:30pm PST.